This famous orchestral interlude was written by Nikolai Rimsky-Korsakov for his opera The Tale of Tsar Saltan, composed in 1899–1900. The piece closes Act III, Tableau 1, during which the magic Swan-Bird changes Prince Gvidon Saltanovich (the Tsar's son) into an insect so that he can fly away to visit his father, who does not know that he is alive. Although in the opera the Swan-Bird sings during the first part of the “Flight”, her vocal line is melodically uninvolved and easily omitted; this feature, combined with the fact that the number decisively closes the scene, made easy extraction as an orchestral concert piece possible. 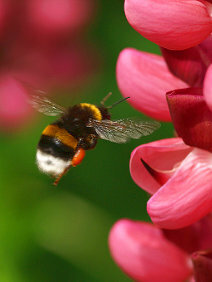 “Flight of the Bumblebee” is recognizable for its frantic pace when played up to tempo, with nearly uninterrupted runs of chromatic sixteenth notes. It is not so much the pitch or range of the notes that are played that challenges the musician, but simply the musician's ability to move to them quickly enough. 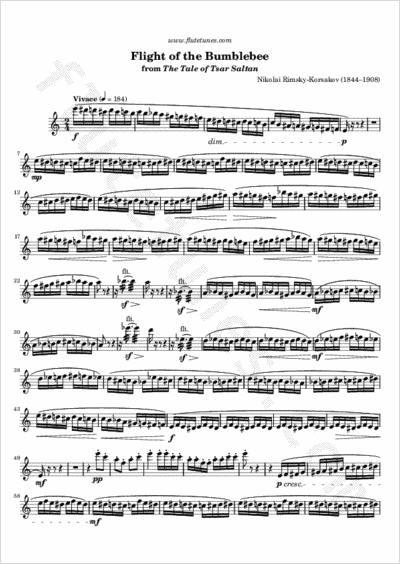 Although the original orchestral version mercifully assigns portions of the sixteenth-note runs to various instruments in tandem, in the century since its composition the piece has become a standard showcase for solo instrumental virtuosity, whether on the original violin or on practically any other melodic instrument.